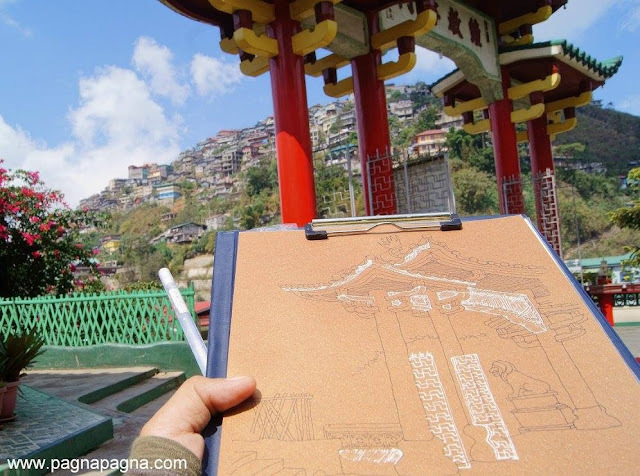 "I went sketching at the temple"
For a moment, I felt like entering into a Chinatown as I walked my way into a street leading to the parking space of the temple. There were some small traditional Chinese gateway arches called Paifang or also known as Pailou. Dragons adorns most of the roofs and some walls. After climbing the stairs into a main Paifang leading to the grounds of the temple, I sat down and started sketching with the Paifang as my subject. There were children training martial arts at the nearby grounds. Tourists started to arrive and I noticed most of them especially the women do not want to go up and climb the stairs into the gardens above anymore, they get tired easily. After I've finished my sketch, I went exploring more of the area. At around 11:30 am, I left the area and went to downtown La Trinidad. at Baguio City ride a jeep bound for La Trinidad (either at the upper street above the Jose Rizal monument below the City Hall or at Magsaysay area) and get down at Km. 3 just before the Welcome arch of La Trinidad. Just tell the driver "Bell Church".